Working in photonics has never been more exciting. New technologies surrounding quantum effects promise secure communication and phenomenal gains in computation power, and explorations into frequency regimes such as the terahertz range are expected to deliver fast wireless transmissions. An equally fascinating use of photonics that’s not directly associated with computation and data transmission promises almost science-fiction-like interaction of digital technologies with biological systems. 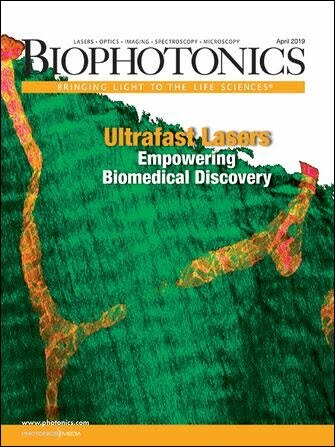 Innovations such as optogenetics enable light to control specific cell groups in a living organism with great spatial and temporal precision. Such discoveries drastically affect the way we design biological interfaces. Recent examples show control over biology’s most complex systems; for instance, targeted delivery of pulses of light to the brain can greatly affect behavior. Results of such experiments illuminate underlying mechanisms, thereby paving the way for more effective treatments of neurodegenerative diseases. Other demonstrations show effective suppression of pain and impressive command over entire organs such as the heart. Even the instrumentalization of living cells can be achieved with light. An integrated example, part electronics and part living cells, involves hybrid robots, such as recently demonstrated swimming creatures remotely controlled just by illumination. These demonstrations show the great potential of light-biology interactions to highlight a pathway to a fundamentally new integration of living things with technology. However, progress has been largely academic, with real-world applications seemingly far in the future. [There is] great potential [for] light-biology interactions to highlight a pathway to a fundamentally new integration of living things with technology. The main technological challenge is associated with the delivery, control, and monitoring of light in a format that is compatible with biological systems. It’s an obstacle that cannot be solved with current rigid forms of digital electronics, light, and power sources, which are all mechanically incompatible with the intrinsically soft biology. Conversely, a solution may be aligned with Moore’s law — the observation that the number of transistors in a dense integrated circuit doubles about every two years. The miniaturization of electronic and optoelectronic components considerably eases the daunting task of integrating rigid, mostly semiconducting elements with intrinsically soft biological systems. As components approach cellular scale, they can be coupled by soft interconnections to enable a globally soft system that is accepted by its biological host; this retains the use of existing highly optimized, semiconducting technologies. Other obstacles in the creation of digital interfaces with biological systems are the supply of power in a form factor, and featuring mechanical properties compatible with the target biological system. Batteries that currently power our mobile devices are unlikely to be suitable candidates because of restrictions in operation time and form factor. A potential solution could be energy-harvesting techniques that obtain power from radiofrequency, light, mechanical, thermal, and electrochemical sources. Combining such a system with suitable wireless data communication can yield powerful tools that enable an intimate interface with biological systems to form a symbiosis of digital and biological worlds. In the short term, this will result in devices that enable digital medicine — an individualized way of aiding patients by chronically monitoring disease and recovery states — to tailor treatment informed by the data collected by such devices. In the long term, devices may act as electroceuticals by actively supporting neural circuits to tackle neurodegenerative diseases or provide a link for broken neural pathways to restore command over areas such as paralyzed extremities. Philipp Gutruf, Ph.D., is an assistant professor in the biomedical engineering department at the University of Arizona, where he leads the Gutruf Lab. His group’s research focuses on creating devices that intimately integrate with biological systems by unifying innovations in soft materials, photonics, and electronics to create systems that will have a broad impact on health diagnostics and neuroscience. Gutruf has authored more than 30 peer-reviewed papers in the last four years, with his work highlighted on eight journal covers. He has received numerous prestigious scholarships and fellowships, including the International Postgraduate Research Scholarship and the Australian Nanotechnology Network Travel Fellowship. The views expressed in ‘Biopinion’ are solely those of the author and do not necessarily represent those of Photonics Media. To submit a Biopinion, send a few sentences outlining the proposed topic to justine.murphy@photonics.com. Accepted submissions will be reviewed and edited for clarity, accuracy, length, and conformity to Photonics Media style.